Penkridge Sanitary Station is a minor waterways place minor waterways place place on the waterways major waterways place village town city on the Staffordshire and Worcestershire Canal (Main Line: Autherley to Great Haywood) between Hatherton Junction (Junction of the Staffordshire and Worcestershire Canal and the Hatherton Canal (under restoration)) (5 miles and ¼ furlongs and 6 locks to the south) and Acton Moat Bridge No 92 (Acton Trussell) (3 miles and ½ furlongs and 4 locks to the north). The nearest place in the direction of Hatherton Junction is Penkridge Winding Hole; ½ furlongs away. 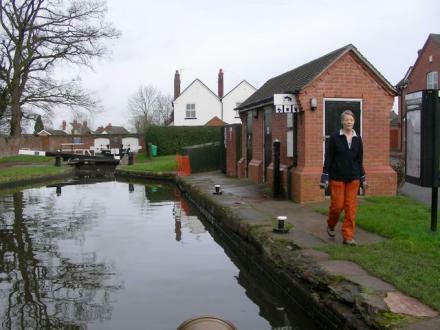 The nearest place in the direction of Acton Moat Bridge No 92 is Penkridge Lock No 38; ¼ furlongs away. 15 princefield avenue, Penkridge, ST19 5HG — 326 yards to the southwest. Stotfold — 850 yards to the west. Penkridge — 1367 yards to the northwest. 10 Chetwynd Close, Stafford, ST19 5SU — 786 yards to the south. Stafford, ST19 5LY — 839 yards to the west. The Seasons, Stafford, ST19 5 — 232 yards to the west. Penkridge — 265 yards to the east. Penkridge, ST19 5QP — 966 yards to the west. Penkridge, Stafford — 1076 yards to the south. Micklewood Lane, Stafford, ST19 5NX — 128 yards to the northwest. Lower Drayton Farm, Lower Drayton Lane, Penkridge, ST19 5RE — 1246 yards to the north. Pinfold Ln, Penkridge, ST19 5QP — 869 yards to the west. Cannock Road, Penkridge, ST19 5DT — 74 yards to the north. Unit 13, Stafford Park 12, Telford, TF3 3BJ — 1047 yards to the south. Market Pl, Penkridge, ST19 5DJ — 394 yards to the northwest. The Peace Memorial Hall, Penkridge, ST19 5AP — 768 yards to the west. Stafford — 1102 yards to the southeast. Mallard Way, Penkridge, Stafford, ST19 5UE — 1210 yards to the south. 49 Saxon Rd, Stafford, ST19 5EP — 246 yards to the south. Stafford, ST19 5 — 1099 yards to the south. Stafford — 373 yards to the northeast. Lavender Florist Ltd, Clay Street, Penkridge, Clay Street, Stafford, ST19 5AF — 628 yards to the west. Penkridge Market, Pinfold Lane, Penkridge, ST19 5AP — 1063 yards to the west. Lower Drayton Farm, Stafford, ST19 5RE — 1252 yards to the north. 3 Crown Bridge, Penkridge, ST19 5AA — 639 yards to the northwest. 2 Levedale Rd, Stafford, ST19 5AT — 38 yards to the northeast. Bellbrook, Penkridge, ST19 5DL — 335 yards to the northwest. 31 Wolverhampton Street, Stafford, 4053 — 888 yards to the southwest. Pinfold Lane, Stafford, ST19 5AP — 941 yards to the west. Gainsborough Arts Centre, Stafford, ST19 — 614 yards to the northwest. Lower Drayton Farm, Lower Drayton Lane, Nr Penkridge, Stafford, ST19 5RE — 1253 yards to the north. Penkridge — 828 yards to the west. The Roller Mill, Teddesley Road, Penkridge, Stafford, ST19 5BD — 658 yards to the northwest. Penkridge, Penkridge — 25 yards to the northeast. Penkridge — 247 yards to the west. Stafford — 1106 yards to the north. Wiscombe Avenue, Penkridge — 243 yards to the northeast. Cannock road, West Midland, Midland, ST19 5RX — 775 yards to the east. Sparta Fitness 15 Brewood Road, Coven, WV9 5DB — 1063 yards to the west. Cannock Rd, Stafford, ST19 5DT — 127 yards to the northwest. Stafford — 226 yards to the northeast. 1367 yards to the northwest.